I live in France since 2006 and I am not able to speak the language fluently until today. But I am on the way to learn it. How do we organize food :) ? After the food problem was solved (25 Pizza), Ori mentioned the problem with Louise. 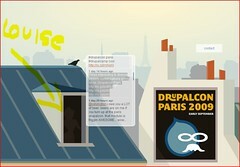 On the website for Drupalcon Paris was a Druplicon with a moustache and in a window beside the druplicon there was a nice girl (Louise). The venue had good wireless connection and I decided to do the Drupal 101 (beginners) Session presented by Simon Elliott. I met Simon in Cologne and was happy to see him here. He is an Englishman in Paris (near Paris) and he has done a good job. He prepared USB sticks with the necessary files and tried to show the people the first steps with Drupal. For me it was interesting to see, because usually I do this job and here I could attend listening Simon in French language. I realized that Drupal is hard to understand for beginners. The next session I saw was the presentation of the new French Drupal Association from Alexandre Eisenchteter. For me, this part was a bit frustrating, because the association still has no website and I was a bit confused after 15 minutes of French words :) I wish, that this process could be more open. Maybe it was, but I hadn’t noticed it (please post links as a comment). Anyway, now there is a French Drupal Association. Vive Drupal! 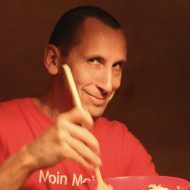 Then Alexandre Eisenchteter mentioned the DrupalCon in September 2009 in Paris and Jean Baptiste Ingold enters the room. As far as I understood they have no masterplan for the conference at this time. The next Session I saw was about module development from Frédéric Marand. He was very professional and knows a lot about Drupal and can talk very fast (yes, in French, what else :). He used Google presentation . This was very clever, because he had no projector and this was a possibility for all participants with a PC to see the interesting slides. Many participants came without a pc. We had only one projector, so in the session rooms, the presenters had a problem (depending on their way to present). Many people came from Paris (most of the organizers) and have to go home in the evening and so we had unfortunately no meeting in a bar in the evening. 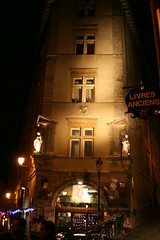 Luckily I was together with Isabell and we found a wonderful place for a typical French dinner in vieux Lyon. 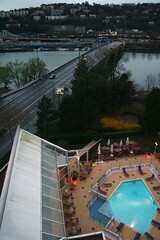 Lyon is an interesting mixture from old and new architecture. DrupalCamp in Provence (I don’t know the exact date). May be I should organize a DrupalCamp in Fitou?